I have been playing with the yonex VCORE 95 now for a couple of weeks and feel ready to write and publish the Yonex VCORE 95 racquet review. This is a control-oriented racquet with a more modern feel. It cannot really be compared to more old-school 95 sq inch frames. What strikes me with this frame is how fast it travels through the air. Thin beam, so-called shark fins, and indents on the frame for more acceleration and a light stock weight. It all is intended to be one fast-swinging stick ready for the modern game. Therefore not easily compared with, for example, traditional HEAD racquets who possess that traditional, more solid, graphite feel. And the VCORE 95D that Stan Wawrinka uses is leaning more towards the traditional feel than this frame does. First of all, the racquet is too light in stock form to pack a punch. Slices are where you notice it the most. This stick is in dire need of lead tape. Even with strips of lead at 3 and 9, I lacked heft on the backhand slice. However, on full swing one-handed backhands, the racquet was a dream to hit with. It begs to be hit hard and fast. Playing a chip-and-charge and slice-and-dice game is not what this stick is intended for. 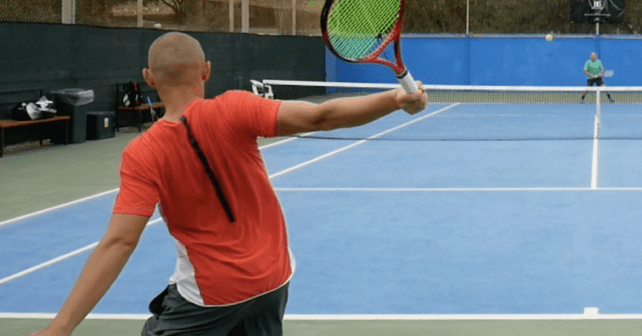 It is meant to be bashed around by players like Denis Shapovalov, who jumps a half-meter of the ground when he slaps his one-hander for a winner. If you are interested in an even bigger sweet spot than the VCORE 95, check out my VCORE 98 racquet review here). As I mentioned in my first impressions post about this racquet, the 310-gram stock weight is a bit light for a 95 sq inch racquet, and it made the racquet unstable at times. It did play more stable with four grams at 3 and 9, but it needs more to be close to the HEAD LM Radical Tours that I normally play with. This is obviously a trade-off between fast to swing and stable. In the end, I added a couple more grams to the hoop to get it up to 345 grams and 32 cm balance. I strung it up with Solinco Hyper-G at 22 kg. The racquet does not feel plush with this setup, but comfortably crisp. The racquet now played more stable, had a bit more power and volleyed even better. I usually play with racquets that are about 10 grams or more heavier, but I felt I still could get a lot of action on the ball and hit both forehands and backhands all out with good control. Even with lead tape it does not feel as good as my more traditional HEAD racquets, but I did get more spin and easier depth with the VCORE 95. This really helped me on my one-handed backhand, which is a shot I that I don’t hit as well on my LM Radicals. What I enjoy about the Yonex VCORE 95 is that I get a bit more power and spin on my shots without sacrificing control. On contact, it feels quite similar to the VCORE Pro 97 (read my review here), but the 16×20 and smaller head size, makes it feel more controlled. I did like the VCORE Pro, but the launch angle felt a bit much and for a 330 gram unstrung stock weight, it still needed a little bit of lead tape in the hoop. The VCORE 95 is faster through the air and with a bit of lead tape, you get the stability and plow-through up to a good level. That makes it a highly customizable racquet for advanced players. Like with many other Yonex racquets, the ISOMETRIC head shape makes the sweet spot slightly larger. On a 98 it does not mean so much for me, but on a 95 sq inch racquet, it actually plays a bigger role. There is a good size sweet spot and heavy hitters will like the possibility to be able to crush the ball with huge swings while still achieving decent control. The racquet seems to work really nice for my game, but you have to expect a crisper response than a Prestige. So the feel on contact is something I miss from plusher frames, but if results tell the story, I seem to play better with this frame than for example a PT57A. I am happy that Yonex keeps a 95 sq inch racquet in their line-up of frames. They have managed to create a flexible frame that still packs a punch and that will deliver on full swings. It does not have the plush feel of old HEAD racquets, but it is easier to use. My main gripe with this racquet is actually the grip shape, which completely lacks a flare at the end and feels a bit too round for my taste. But that is the Yonex grip shape and nothing unique about the VCORE 95. I am not sure I am honeymooning just yet, but I will keep the racquet in my bag for a while more while I test other frames. It is definitely one of the best frames I have played with this year (like always, the best gear of the year post will come in December). It trumps the VCORE Pro 97 330, which I liked but did not love. 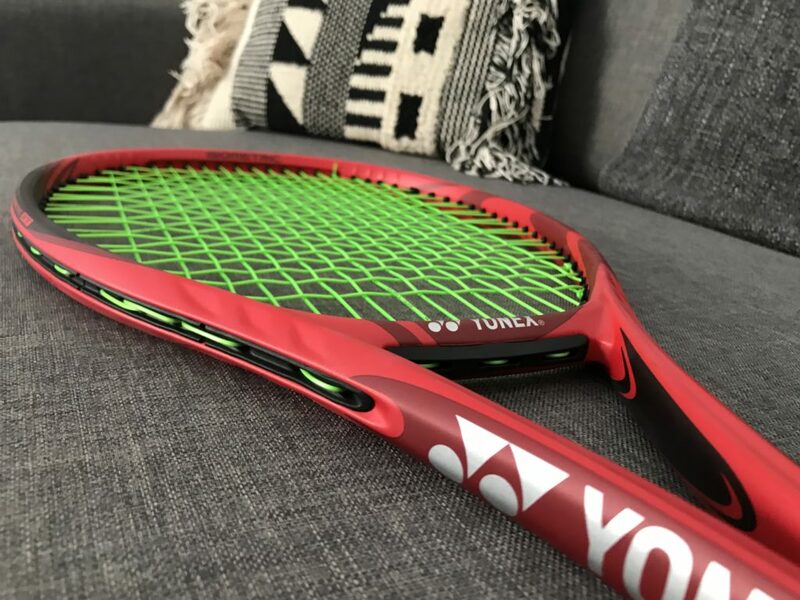 If you are in the market for a control frame that is easy to customize and begs to be swung fast, the Yonex VCORE 95 might be your next racquet of choice. I do recommend to demo it because the feel of this racquet will not be everyone’s cup of tea. However, I have a hard time arguing against the results I have had playing with this racquet so far. This goes up on the potential switch-list for me. But I will not make a decision until I create my next gear-of-the-year list. What do you think about the Yonex VCORE 95? Is it something you would be interested in trying? Please comment below! I was wondering what your thoughts are on the retail Head Radical MicoGEL racquets? I’m planning to buy the MP, but I was wondering how they are viewed. The Microgel Radical MP is a very nice racquet. If possible I would try to find the first edition and not the re-release since the first one is much softer. How do you compare this one with the XT Prestige pro, mainly in comfort, power and sweet spot size aspects? Thanks for the quick response. Is there any way I can get the retail racquet up to the specs of the old MicroGEL? How different is the feel? What’s your opinion on the MP vs the OS of the MicroGEL? How much lead would you reccomend and what kind of strings would best for the racquet and for someone who wants control, feel, and has much spin as possible without sacrificing the feel and control? The older version of the Microgel MP is a nice stick, very plush. The VCORE 95 is definitely crisper. And the OS version is a different beast altogether since the head size of the MP is really 95 and the OS takes a lot to swing. On the MP I would start by adding 4 grams of lead at 3 and 9. If you still want more power and stability after that, I would also add 2 grams at 12 o’ clock. If the balance feels off, add some lead tape on the handle underneath the base grip or put on a leather grip and you have a nice weapon on your hands. Regarding strings, I would go with a softer poly for that one. Maybe Luxilon Alu Power, RS Lyon or Laserfibre JB Tour 100. If you want even more spin, Solinco Hyper-G could be a good option! I did not like the XT Prestige Pro a great deal. It felt somewhat stiff and jarring on contact. The VCORE 95 still packs some good power, but is plusher and a better racquet in my opinion. Bigger sweet spot, more comfort. Regarding the vCore 95, the vCore 95D, the Ultra Tour and the Angell TC97, how would you rank these four racquets? VCORE 95D, VCORE 95, TC97, Ultra Tour. I do like the smaller head size which makes the key difference here. All good racquets, the Ultra is the most low-powered one. 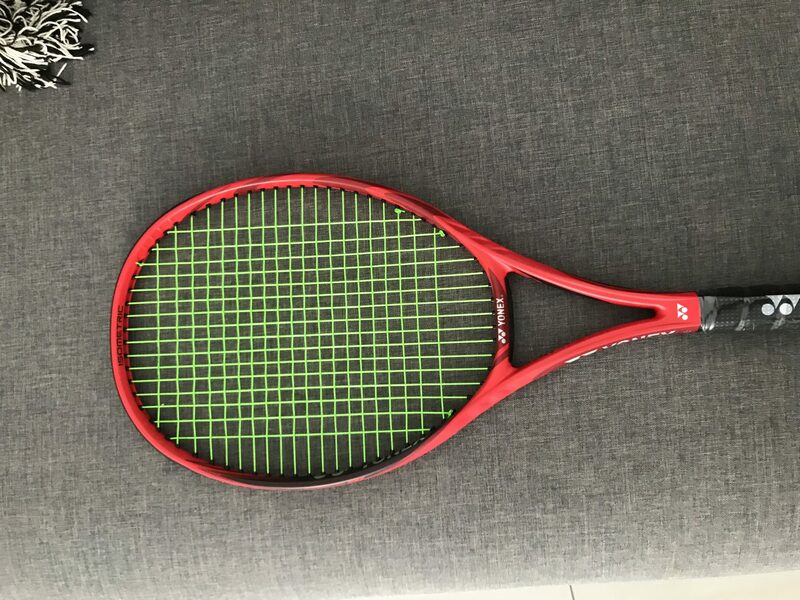 I would like to buy a 95 inch racket, but can’t decide between this yonex vcore95, prince tour 95 and the angell 95? A good mix of these sticks that I’m, enjoying at the moment: Dunlop Srixon CX 200 Tour. VCORE 95D, VCORE 95, TC97, Ultra Tour (and K7). Also, could you please rank them in similarity to the PT630 (in a separate ranking)? This will help a lot. I am moving from 3 years of Angell TC95 63RA 16×19, to vCORE 95D and currently prefering the Ultra Tour. HI Jonas, I tested the Yonex VCore 95 this weekend and I am very impressed about this frame after having added lead at 3, 6, 9 and 12. I would like to know how this VCore 95 compares to the SV 95 because the SV 95 can be found for great discounts currently. Can you please give feedback how these rackets compare or differ? I m currently using the Vcore pro 97 330. I would like to find a racquet that can match the stability and plow thru of it but easier to use. G360 Speed Pro, Vcore 95 and CX200 18X20 Tour are on my list. can you compare them in terms of stability, plow thru and feel? since you have mentioned on contact, Vcore95 feels quite similar to the VCORE Pro 97, can you tell me more? Hi Jonas, how would you compare this frame to the Yonex VCore Pro 97 (310g)? I demoed it and loved it but am a big hitter and would maybe enjoy a bit more control on full swings. I also tried the VCore 98 and although I liked it, it felt a bit too powerful. Thanks! WHats your customization recommendation for the VCore 95? I’m thinking that a total of 3g at 3 and 9 really seem to bring out the best in the frame. Their specs are quite a like, do you find these are similar rackets because I really like how my Wilson plays. They have similarities for sure. The VCORE 95 is less stable, but easier to maneuver and offers a bit more spin. I would suggest to add some lead tape at 3 and 9 or 12 to increase the stability and get some more power.